In recent years a number of Chinese stars have lent their voices to dub Mandarin versions for Hollywood films, and actress Huo Siyan is the latest celebrity to do this. 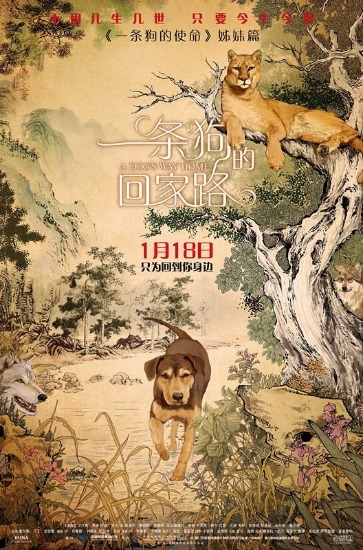 In Columbia Pictures' film A Dog's Way Home -- which opened across Chinese mainland on Jan 18 -- Huo voices Bella, the canine protagonist who treks more than 600 kilometers in over two years to reunite with her owner. The film opened on 11.5 percent of China's over 60,000 screens to gross nearly 3 million yuan ($442,600) on Friday. Huo, known for the 2016 TV series Finding Mr Right, says the movie marks her first time to voice an animal character. In the original English version, Bella is voiced by Bryce Dallas Howard, who is known in China for her character of Claire Dearing in Jurassic Park films. The film, based on a book by American author W. Bruce Cameron, is the last dog-themed film to be released in the Year of Dog.